Here is a little about me. My Name is Greg Wyatt and I am the owner of Prescott Gold and Silver, and a Prescott resident since 1995. I am a bit of an entrepreneur, and have started and run many successful businesses, and some that were not. When I first opened Prescott Gold and Silver, I did business as the Honest Gold Buyer. Later I coined the term Honest Gold Guy. As I recorded videos about my gold buying business; others around the nation contacted me to learn how to start a gold buying business in their town. This lead me to start Scrap Gold University an online school to teach dealers in other areas how to buy and sell gold and silver. I closed the school in 2014 as precious metals prices dropped. Honesty and integrity are important to me, and my former students. From the start of my business, I have done my best to treat my customers as I would want to be treated. This has paid off in good customer feedback online, and strong referrals for my stores. 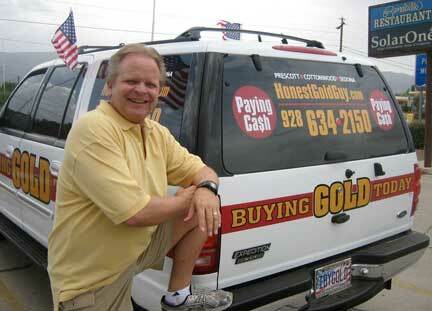 With over 80% of my business coming in as referrals, it’s important for me to continue to be "Prescott's Honest Gold Buyer." I serve the communities of Prescott, Chino Valley, Prescott Valley, Camp Verde, Cottonwood, Surprise, Payson, Wickenburg, Cave Creek, Anthem, Phoenix, Wittman, and Sun City, Az. if you are in or visiting Prescott, just stop in to sell your gold. At present I work by appointment. Please feel free to call me at 928-710-2137 for all your precious metals buying and selling needs.